I have been asked several times by now, "Did you quit blogging?” I am sure you may have wondered too. No, I didn't quit blogging. Lot of things happened in 2017 and I couldn't cope up with other priorities and blogging at the same time. I surely missed blogging. I was cooking and experimenting even though I was not post anything. I get mixed reviews from my friends and family about the blog. One of our family friends once told me “I don't really have the time to read all the stories (of course joking), I just need to see the recipe. “ A bunch of my friends were there and we told him, "Oh yeah, there is something called scrolling using a mouse, you can scroll down to the recipe if you don't want to see the rant". We just teased him that day. But I know who has the time to read when you are busy. I always encourage people who are just looking for recipes to just go right to the recipe. But don't stop visiting my page.... you are my motivation to try something new, take pictures and present it for you. If you have some leisure time, just go through my ranting. Hope I made it fair enough for all kind of visitors. I do visit blogs to just read the stories rather than the recipes. Some authors are so good to keep the connection with their readers. They make the stories connect to yours and make you visit their blog again and again. I always love reading stories connected to food. 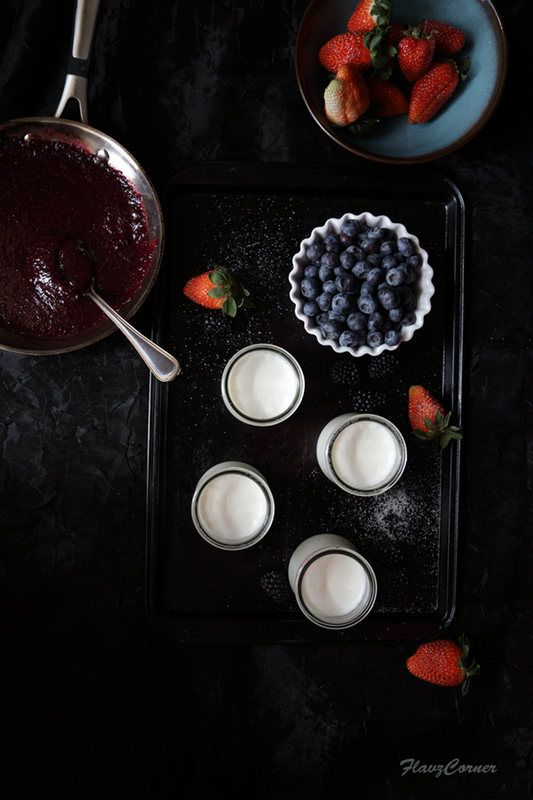 Today's recipe is a simple yogurt dessert cup. I still remember how yogurt was made at my grandparents' house. We used to stay at our grandparents house during vacation. My grandparents owned cows. Big batches of yogurt were made and stored in earthen pot to be used in many dishes. The traditional way of churning the butter out of the buttermilk needed some skills. The buttermilk filled earthen pot was placed on a jute ring to keep it steady. On top goes a wooden lid with a hole in the center with a wooden paddle going down into the butter milk. The handle of the wooden paddle is then coiled with a jute rope for easy to and fro movement. The churning of butter is usually done by sitting on step stool to adjust the height. The pot is secured between the legs and the whisk/churn action with paddle technically happens when the person pulls the coiled rope around the paddle handle back and forth. Me and my brother gets excited about the whole process and always wanted to try. My brother was always curious to see if the butter was ready after couple of pulls. We used to lift up the lid and check inside the pot. The ladies in the kitchen were extra cautious and used to hold the pot tightly, because they knew that if left unattended we will spill all that pot of goodness. It takes good amount of time and needed lot of muscles power to make a good amount of butter. I guess that was the way of a good upper body work out those days. We used to give up easily and leave the pot in the kitchen and run away. Those were all fun filled days when we get to do all mischief and get away with it. 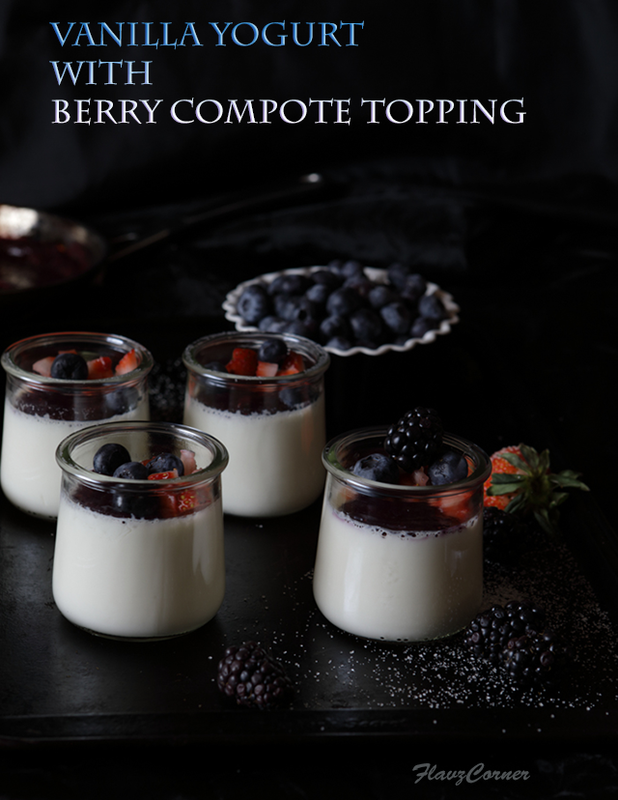 This simple vanilla flavored mildly sweet yogurt is best when prepared with whole milk and topped with the the berry compote and some fresh fruits. I make a batch every week and kids love them as an after school snack or a dessert after dinner. Please do try this recipe and let me know. 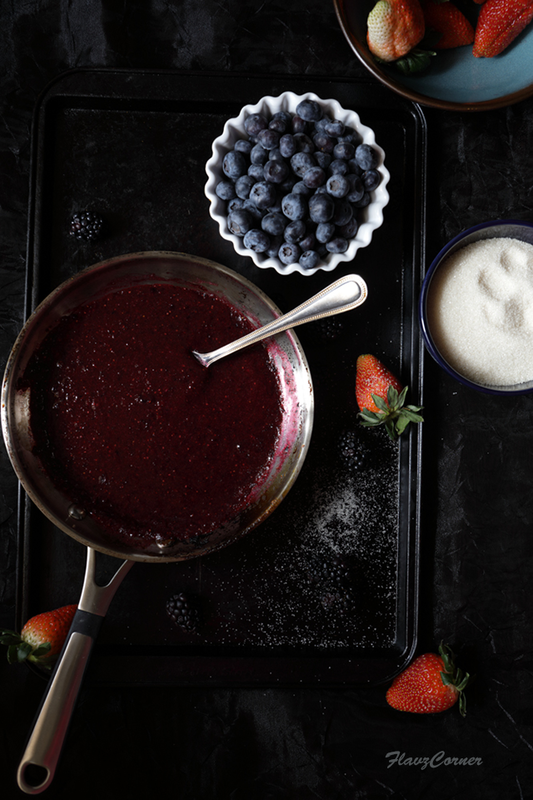 Combine berry puree and sugar and bring it a boil in a sauce pan. Adjust the sugar per taste and turn off the flame. Set it aside to cool. Keep it refrigerated once its cold till the yogurt is ready. Boil milk on low to medium heat; turn off the flame and let it cool down to luke warm temperature. Add 4 tsp of sugar, 4 tsp of plain yogurt and 1/3 tsp of vanilla extract and mix well. Pour into small dessert cups of 1/2 cup size. Warm the oven to 180 ° F and turn it off. Place the prepared cups on a baking sheet and keep it in the oven for 4 to 5 hrs with the oven door closed or keep the cups in a dark warm place. The yogurt should be set after 4 - 5 hours. Take it out and cover the tops with plastic wrap and refrigerate for at least 1 hr. 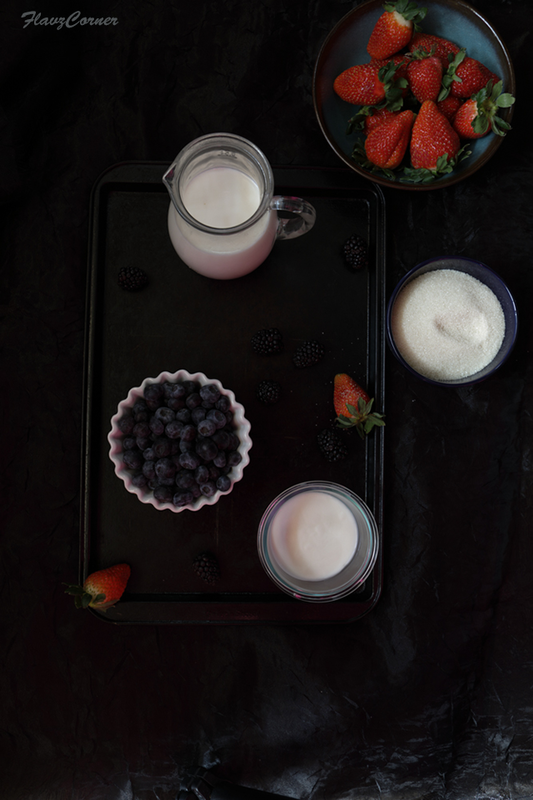 Before serving, top the chilled yogurt with berry compote and fruits of your choice. While boiling milk, make sure you use a low to medium flame and stay next to it. If unattended, it will rise up and spill. The texture of the yogurt comes out good if you use whole milk. The longer you keep the yogurt outside, the more sour it can turn into. So make sure you take it out after 4-5 hours or as soon as it sets. I adore healthy desserts like this...those berries are so plump and juicy. Hehe... good to see you back to writing again, I did wonder too but then life does get busy... :) this vanilla yogurt sounds really delicious. Never tried making yogurt myself but this one is definitely up my alley... pinning it up! Good to see a new post from you! And what a wonderful post -- this looks utterly delish. Thanks! Oh, my! This yogurt dessert looks simply fantastic. Love your photography and recipes. That's a lovely dessert to try. I do not have a sweet tooth and hence hardly indulge in desert making. Just this morning I was thinking of trying my hands on some simple deserts and this sure fits the bill.